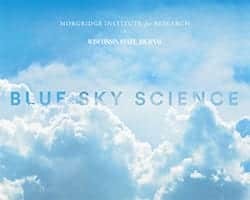 News & Stories > Blue Sky Science > How does our immune system recognize bad from good? The immune system is a network of different cell types such cells as T cells and dendritic cells. They make up the white blood cells that are circulating in our bloodstream and make up our bone marrow, spleen, and lymph nodes. These cells are created through random DNA recombination events which result in placing something called a T-cell receptor on the surface of a cell. This allows it to recognize a unique protein sequence called its antigen. The T-cell receptor has to be presented by a cell called a dendritic cell or an antigen presenting cell. This interaction is similar to a lock and a key mechanism. These cells come together as part of the initial recognition phase. The thymus is an organ that sits in our chest right above the heart. A cell in the thymus will become a T-cell and get educated about good and bad. The first lesson it learns is what’s good, but only cells that have the capacity to recognize something potentially bad are able to leave the thymus and explore the body for threats. An autoimmune disease is a scenario where the immune system is attacking self, or auto. Insulin-dependent diabetes is one example that is well-recognized. This is when the immune system attacks the cells that make insulin, which are in the pancreas. Immunologists hope to understand how to reverse the course and restore order, so that individuals don’t have to take medications that suppress their immune system.